SendPulse is a versatile communication medium which is an inevitable for your business growth. The primary function of SendPulse is to seamlessly send emails, SMS, Push Notifications to clients that is beneficial in flourishing your business. We know that the most important aspect of any marketing or service based business is communication with customers. With the fast evolving internet and several communication technologies revolving round it, any business will lag behind its competitors without a strong communication infrastructure. What are the prominent instances of communication with customers that can leverage their business? 1. 24×7 online and phone support. It is best if accompanied by a chat service throughout the day. 2. Prompt SMS service sent to customers about special offers and deals. 3. Emails sent to customers on occasions of confirmations of registration, for helpline and limited time offers. 4. Regular communication interesting newsletters to attract customers to your company. For such an uninterrupted communication between the company and its customers, it is not possible for human beings to organize and execute so much data. You need to seek help from a computerized service. There are many companies who are now providing this service and SendPulse is one of them. 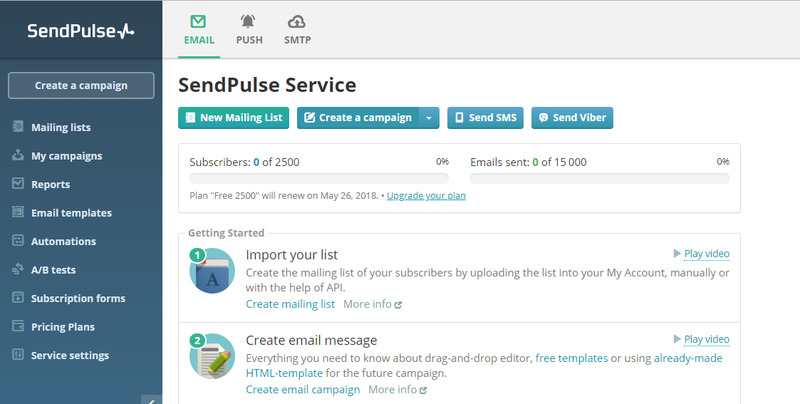 SendPulse is powered by an artificial intelligence technology that regulates and organizes the Email, SMS and other communication services with utmost ease. SendPulse is a startup company based in the United States. In a very short span, the organization has garnered huge accolades. SendPulse was among the 3 finalists of The Next Web SCALE 2016 program and was mentioned as one of the best startups in 2016 by The Next Web. The Startup Accelerator of SendPulse provides $ 5,000 grants for email marketing development to all its participants. Automation 360 is one of the most versatile tools of SendPulse. There are several facilities provided by Automation 360. Example: trigger emails after registration, not yet purchased items in cart, thank you and acknowledgement emails. The process of using Automation 360 is very simple. You have to create an event, and generate an OTP, Then, an auto-responder will be initiated. Next, the event, that is holding of discounts, giveaways, etc., will be triggered. The auto-responder then activates itself and sends all the desired messages. A very easy to use and self explanatory user interface. That doesn’t mean it lacks customization options. 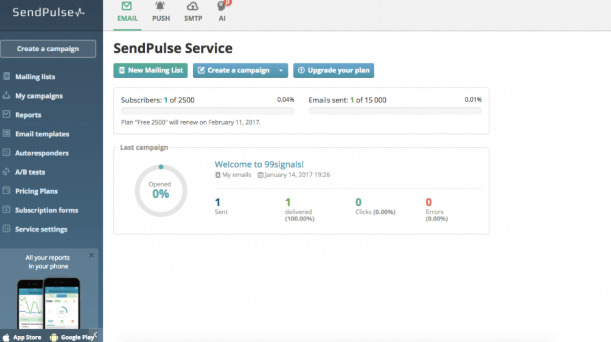 SendPulse has a plethora of customizable settings from which the user can make a choice. SendPulse supports multiple channels under one roof. That is, you can deploy the SMS, Email and Push Notification service all under one roof. It helps you keep an account of all the email conversations between customers and employees. This helps the company in getting information about the customers’ preferences and the performance delivered by its employees. It provides visual statistical data for better understanding. 6. SendPulse has the same quality of services, but at a more affordable rate than its competitors. It offers web push notifications for free, and free email and SMTP services with least restrictions. 7. In terms of customization options, SendPulse is amazing. It has an amazing collection of email templates, impeccable drag and drop constructor, consolidated EMAIL, PUSH and SMS alert. 8. SendPulse has a subscription form creating tool with which you can create subscription forms of different formats. 9. SendPulse deploys high end technologies in order to deliver fine services. It sends messages to CRM and CMS systems. These messages are then integrated with shopping scripts and online services. With a deep integration of CRM and CMS, you can perform a plethora of functions like sending notifications directly from your project, tracking campaigns and viewing statistics. 10. SendPulse is also powered by REST API. This service combines a set of procedures to perform receive and request options for each operations. The answers usually return in form of JSON structures. That’s all about SendPulse. It is a feature rich service that works amazingly for marketing based businesses. We highly recommend you use this service. How To Insert Event In Your Facebook Uploads for Android?